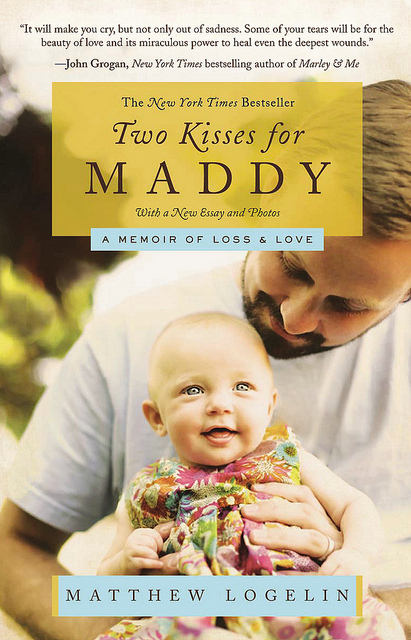 If you’re looking for a tear jerker, Two Kisses for Maddy is the right book for you. It’s a memoir of a single dad trying to cope with the loss of his wife, while raising a newborn. Matthew Logelin writes about his wife and how they came to meet, fall in love, and what their marriage was like. It was clear that they really loved each other and that he adores her. The sad truth is that bad things happen to good people and his wife died giving birth to their baby girl Madeline. Liz never got to hold her. The book then became about Logelin trying to survive and adapt to a world without his wife and to raising a baby. I found this book when I was at Target looking for another good memoir to read. I’m no stranger to the book isles there and I’m sure the employees consider me a regular. If my fiance wasn’t with me I’m sure I would have stayed for hours just looking through the books and reading the back covers. I won’t even mention how long I end up staying in a Barnes & Noble store. I think this book is better suited for those who can relate to it. I know that I related to it. Not that I’m a single father, but my youngest sister didn’t get to know our mother like I knew her. Our mother died when I was nineteen and my sister was four. I don’t think she will really remember her mother except by what I tell her. That’s the reason I connected to this book so much. While it tells the story of how a father is working through being a single dad and a widow, I have a feeling he will have to answer the same questions I did with my sister. Where did mommy go? Why isn’t mommy here? What happened to mommy? These are a few of the questions my sister has asked when my mom first passed. It also shows what having a great support system will do. Logelin had many friends and family members that helped him work through his loss and adjust to being a father. When my mom died, having my friends and family around kept my mind off of it and I was able to move forward. It still hurts when I think about her and I suspect it is for Logelin too, but each passing year gets easier. This book is also a great example of how blogs can change someone’s life. Logelin started a blog meant for photos of his travels and a way to keep his family updated. After his wife died it became a way for him to deal with his loss. According to Logelin it was also becoming Madeline’s baby book. You can visit his blog where his gives updates on what he and his daughter are up to (Matt, Liz and Madeline). The only thing I would warn readers is that there’s a lot of foul language in it. I personally didn’t mind that it was there. I think it really added to the story and I could feel the emotions more, but if you get offended by that stuff you probably shouldn’t read it. Let me know your thoughts by leaving a comment. If you’ve read the book already I would love to hear your opinions on it. Did you relate to it like I did?